Small, well-made and perfectly functional, the DS1 is a solid mix controller, particularly if there's a script available for your DAW. Solid construction. Compact. USB powered. Configurable LED buttons. DAW scripts are limited. No colour LEDs for knobs and rotaries. Quite expensive. 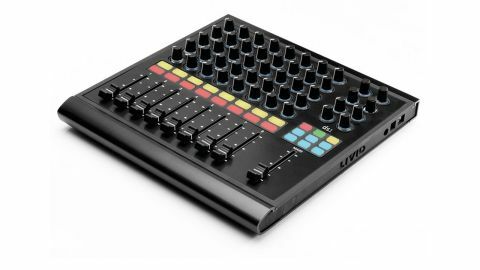 Designed in collaboration with US music production college Dubspot, Livid's DS1 is primarily a mixing controller, arranged as an eight-channel mixing bank with a master section to the right. Each channel comprises five backlit knobs, two buttons and a fader, and the main section houses a 3x3 grid of smaller buttons, four knobs, four rotary encoders and a 'master' fader. "We tried the Logic Pro X and Live 9 MIDI scripts, and found the setup process to be very straightforward"
The rotary encoders feature continuous notched travel and push button functionality, while the knobs are un-notched and have fixed end points. All 25 buttons incorporate configurable RGB LEDs, capable of showing any of seven colours or being turned off, and although the knob and encoder backlights can't be changed, there is a retrofit pack of coloured collars available direct from Livid. The DS1's aluminium case, black rubberised edging and overall construction quality give it a solid feel, and at just over 30cm square and 5cm deep, it's eminently portable. It's also USB bus powered with optional AC adapter input, and includes an expression pedal jack at the back. The DS1 is a 'blank canvas' controller that requires MIDI mapping to your DAW before it'll do anything. Currently, Livid offer downloadable scripts for Ableton Live 9, Bitwig Studio, Apple Logic Pro X and Native Instruments Traktor, with FL Studio and Reason in development. We tried the Logic Pro X and Live 9 scripts, and found the setup process to be very straightforward. However, with such a small number of controls available, compromises have to be made. In this respect, the Logic Pro X script is quite traditional, with three of each channel strip's knobs tied to Channel EQ gains, one to Aux 1 and one to Pan. The channel buttons handle mute and record arm, and the fader controls the track level. The rotary encoders control further EQ settings and channel strip navigation, and the other four knobs are tied to the Aux 1 channel settings. The 3x3 grid serves up the full array of transport controls, and the master fader sets the main output level. Live 9's script is rather more adventurous. All five channel knobs and three of the four encoders are mapped to the first five channel and first three master channel device Macros respectively, with the fourth encoder used for track selection. Meanwhile, the 3x3 button grid handles transport, clip navigation and global cycling of the two channel mute and solo buttons through two further options - record arm/track select, and clip launch/stop. Of course, the DS1 can also be configured however you like using the Livid Editor and your DAW's regular MIDI controller mapping system. The DS1 will be of particular interest to those who favour a truly open-ended design, where every knob, fader and button can be freely assigned as desired. For studio mixing duties, touchscreen tablets are proving themselves to be a valid and flexible alternative to dedicated hardware, but the DS1 confidently states its case with its rugged build quality, satchel-sized portability and - importantly - genuine tactility.